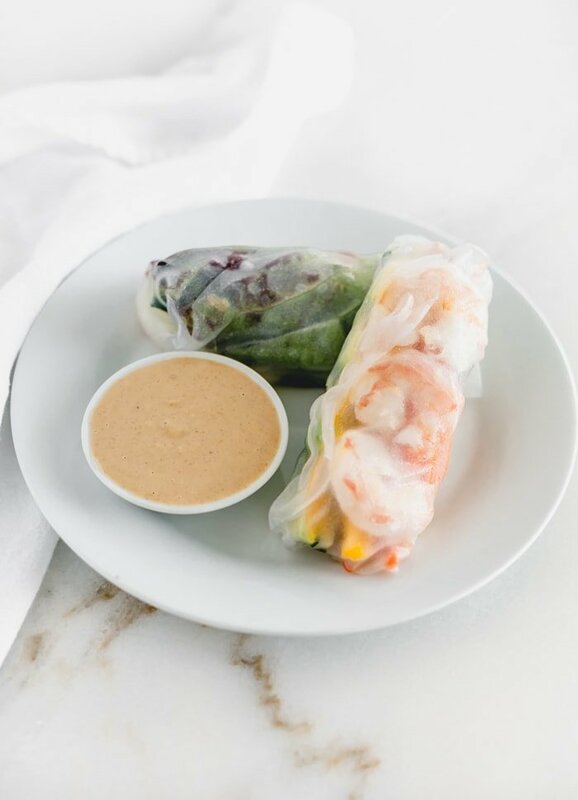 Healthy and delicious mango shrimp spring rolls with a delicious peanut dipping sauce are easy to make and perfect for a snack, appetizer or light lunch! Do you ever get a craving for spring rolls? I do! In my experience, spring rolls can either be really delicious or really bad (looking at you grocery store sushi counter). So it’s definitely advised to go homemade to fulfill your craving if you don’t want to go to a restaurant. I first learned how to make spring rolls at my aunt’s house. She had pre-cut all of the ingredients (which are always so beautiful with all of the colors) and we rolled them up in a sort of build-your-own-spring roll kind of fashion. It was so fun and way easier than I had thought. So that you can experience the fun for yourself, I am going to line out the steps for you. First, cut up and gather all of your ingredients. Prepare a clean workstation. I use a plastic cutting board, silicone baking mat, or clean countertop. Then prepare your rice paper by soaking it in warm/hot-ish water (not boiling- I keep it on low on the stove) for 1-2 minutes to soften it. 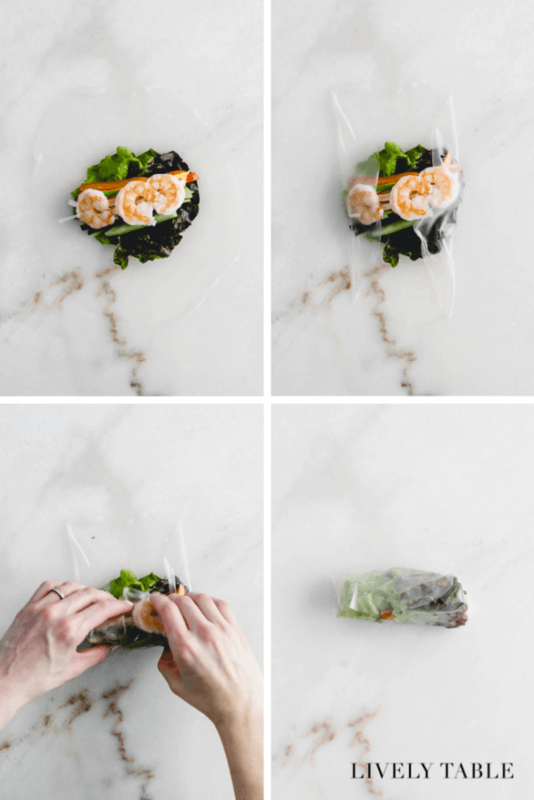 Remove the rice paper from the water, flatten it out on your surface, and fill with your fillings. I like to lay down an piece of butter lettuce, then add the shrimp and veggies. Fold the two short edges over. Fold one long side over the fillings. Then roll up the other long edge (It’s like folding a burrito). 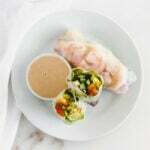 For these rolls, I used a combination of shrimp, mango, and fresh veggies and herbs, paired with a simple peanut dipping sauce. 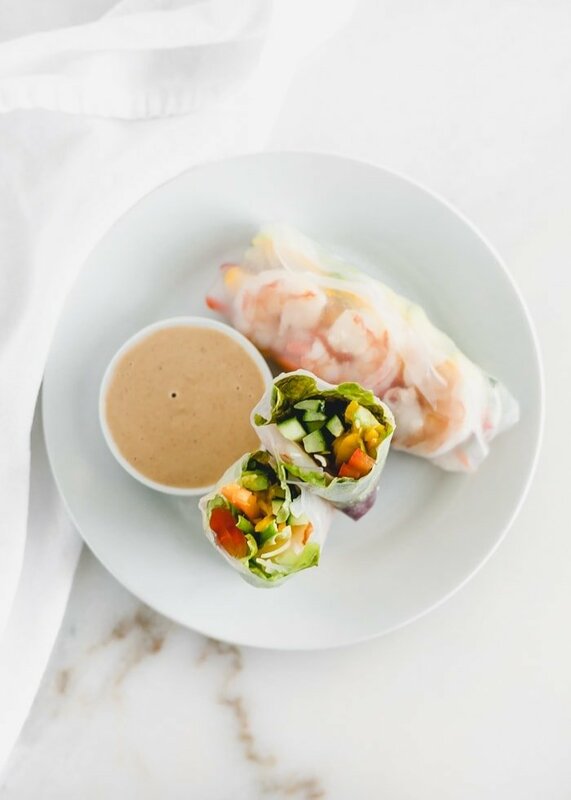 Because spring rolls just beg for a good peanut sauce. I hope this post has helped inspire you to try making your own spring rolls! 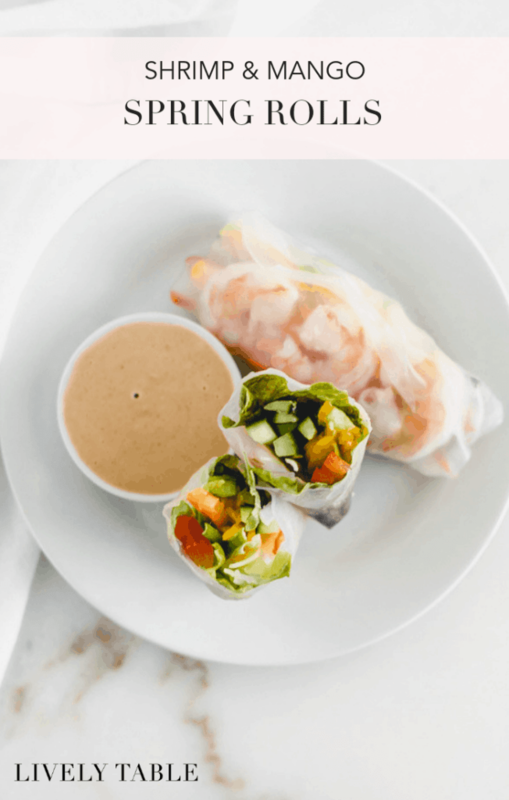 If you’re looking for more spring roll inspiration, take a peek at my thai chicken salad spring rolls! Marinate shrimp in lime juice, oil, garlic and pepper for about 10 min. Grill or sauté over medium heat, 1-2 min per side. Cool before butterflying shrimp. Peel and julienne vegetables and mango into very thin strips. Dip rice paper in warm water until soft, about 1 minute. Remove onto smooth work surface and spread flat. Add ingredients in straight line down the middle. Fold in the two short edges. Fold one long edge over the filling, then roll up like a burrito. Repeat with remaining ingredients. Keep rolls under damp paper towels until you’re ready to eat. 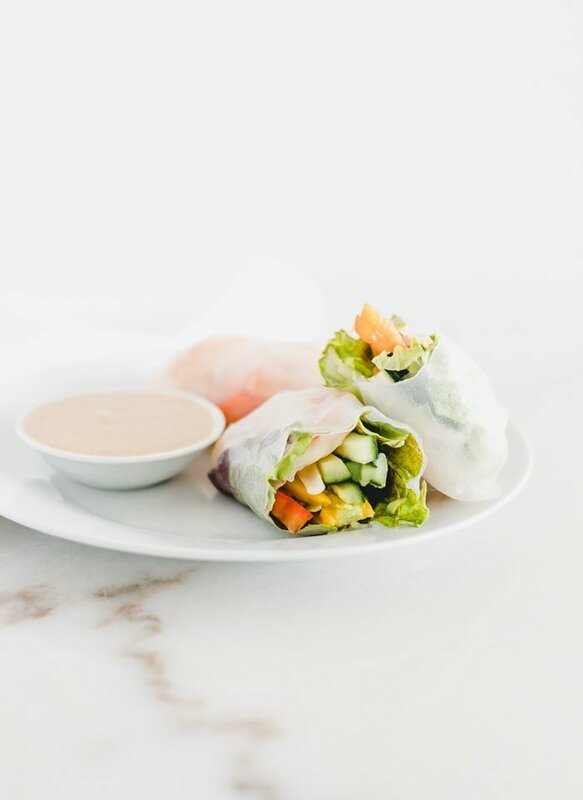 Store spring rolls wrapped in a damp paper towel in an airtight container in the refrigerator up to three days.